l'Argolide l'Epidaurie, la Trezenie l'Hermionide, l'Isle d'Egine et la Cynurie Pour le Voyage du Jeune Anacharsis. 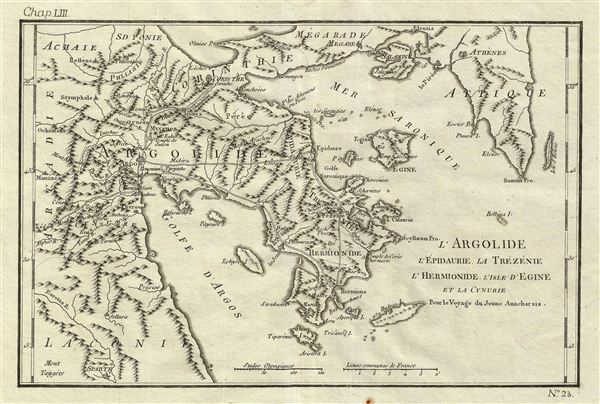 This is an attractive 1791 map of Argolis in Ancient Greece. The map covers the region southwest to the Isthmus of Corinth and includes the island of Aegina. The cities of Athens, Corinth, Troezen, epidaurus , and Argos are identified. It is here that the Shrine of epidaurus, dedicated to the god of medicine, Asclepius, was located. Prepared by M. Barbie de Bocage in 1791 to illustrate the Travels of Anacharsis. Very good. Original platemark visible. Original centerfold. Blank on verso. Dark clean impression. Margin contains few water stains, none extending over printed map.